Stock photo of the Toronto Skyline at night as seen from Hanlan's Point Ferry Terminal on Centre Island in the Toronto Islands of Lake Ontario in Ontario, Canada. 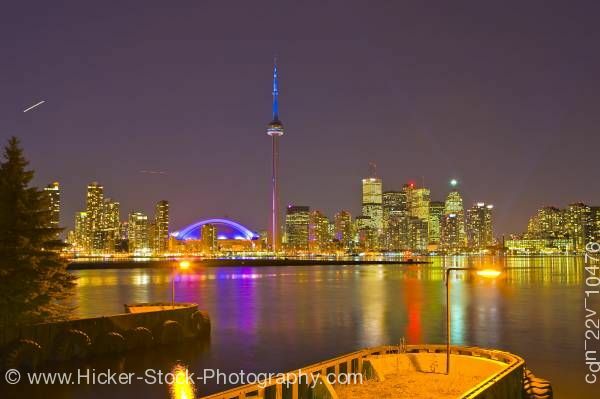 This stock photo shows a colorfully lit Toronto City Skyline seen at night from Hanlan's Point Ferry Terminal on Centre Island, Toronto Islands, Lake Ontario, Ontario, Canada. The yellow, orange, purple, blue red, and green light coming from the buildings along the skyline reflect onto Lake Ontario. In the foreground you see a ferry at dock and the shadow of a tree on Centre Island at Hanlan's Point Ferry Terminal.